Remembering my 101 year old grandmother speaking of the “Old” people that she knows, conjures up how I felt as 40 passed by…some time ago now. Old is definitely getting older with longevity and happiness as factors in our opinion. 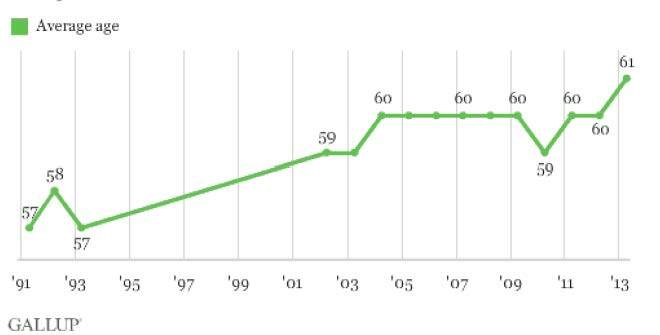 According to a recent Gallop poll, see graph below, the average age of retirees or expected retirees is now 61, far from the age 57 retiree in 1991. As you can tell from this Gallup poll, the retirement age is rising and we believe it will continue as self-employment and technology mobility along with improved longevity all add to the equation. In closing this is a very interesting subject for us and we intend to study it in greater detail along with various aspects of the retirement picture. We may even conduct our own poll in the future. We find often that many are working and intend to work far further into the retirement age zones of old. The new fancy dancy server is on deck and ready to go. We will be shut down from email, vault and saved information the last two days of May as the migration occurs. We will notify you again, but wanted to give everyone a long runway of notice. We have commented various times on the importance of taking a few moments to review your annual social security statement, most recently in our in our Q 1 2011 Newsletter which can be found on our Newsletter page. One of the key items to review is your credited quarters and salary, as there are constraints from the Social Security Administration in correcting these reported amounts if incomplete. As luck would have it, within a few months of our directing you to the importance of reviewing your statements, the following showed up on the Social Security website. “In light of the current budget situation, we have suspended issuing Social Security Statements” reads the Social Security website. Since the statements are not being permanently halted at this time, it is important, that we as tax payers, make sure we keep good records of our earnings history, (W-2’s) in case there are reporting problems. We will update you on the status of next year’s statements, as a second year of absence would create more urgency for the agency to allow an electronic statement, which I requested they implement during my conversation with the administration.